During the cold winter months when pastures contain scant forage, hay is the typical diet for cattle, horses, sheep and goats. Next to pasture, good quality hay is the ideal feed. However, there are significant differences in the variety, quality and availability of hay, which can make feeding your livestock a time-consuming chore. 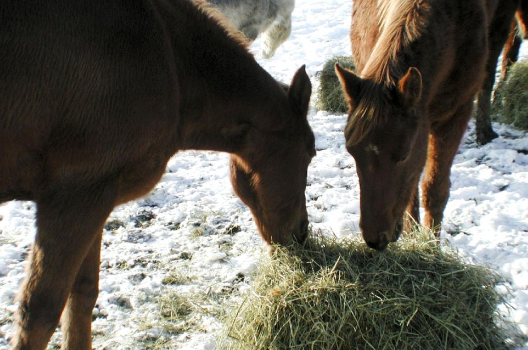 But with some planning, feeding hay during the winter months can be a simple and efficient alternative while waiting the return of spring’s lush pastures. Hay falls into several categories: grass, legume, mixed (grass and legume) and cereal grain straw (such as oat hay). Some of the more common grass hays include timothy, brome, orchard grass and bluegrass. In some parts of the country fescue, reed canary grass, ryegrass and Sudan grass are common. In northern parts of the United States, timothy is widely grown because it tolerates cold weather and grows early in spring. It does not do well in hot climates, however. In central and southern parts of the country you are more apt to find coastal Bermuda grass, brome or orchard grass because these tolerate heat and humidity better. Cereal grain crops (especially oats) can make good hay when cut while still green and growing, rather than waiting for the seed heads to mature for grain. There is always some risk of nitrate poisoning, however, if cereal grain hays are harvested after a spurt of growth following a drought period. If you are considering purchasing this type of hay, it can be tested for nitrate content. Legumes used for hay include alfalfa, various types of clover (such as red, crimson, alsike and ladino), lespedeza, birdsfoot trefoil, vetch, soybean and cowpeas. Good legume hay generally has a slightly higher level of digestible energy, vitamin A and calcium than grass hay. Alfalfa may have twice the protein and three times the level of calcium than grass hay. Thus alfalfa is often fed to animals that need more protein and minerals.